In the last 10 years the game of tennis has seem some serious changes; players are hitting the ball harder, deeper and heavier (a combination of power, depth and spin) than ever before. Players are forced to be in amazing physical shape and an emphasis on conditioning that didn’t used to be so prominent has emerged. Some analysts attribute the raised level of play to the newest advancement in tennis string technology: polyester strings. Polyester strings are currently the hottest thing in the tennis market. Because these strings offer a stiffer string bed, the player has greater control of the ball coming off the strings, even at very high swing speeds. The stiffer strings also cut into the ball better than synthetic’s offering up more ball bite, which translate into spin. Polyester was first introduced as an alternative to kevlar for those who broke synthetic strings too quickly and wanted a durable alternative. Although they provided a long string life, they had poor tension maintenance and were also very stiff and often harsh on the elbow/arm, making them less than ideal for the average tennis player. Since their initial introduction, manufacturing and string technology has allowed companies to produce polyester strings that maintain the benefits of durability while lowering the stiffness level, thus making them better suited to the majority of the tennis playing community. Strings like Pro Supex Big Ace, Signum Pro Poly Plasma, Genesis Black Magic and Topspin Cyberflash exemplify this group. They allow the user all the benefits (control, spin, durability) without the painfully stiff feel of the original first generation polyesters. Most recently the string market has brought us a newer version of these polyester strings. Polyester strings already have great ball bite and spin, but manufacturing the strings with texture provides even greater access to extreme amounts of spin on the ball at any speed. This has created a new group of strings: textured polyesters. One method of creating a textured polyester is to manufacture the string in a way to create a hexagonal shape as the string’s cross section. Signum Pro Poly HEXtreme is one of the premier strings in this group. The hex-shape provides great ball bite, but compared to the other texturing methods tends to be a little bit stiffer. Like other strings in the Signum Pro Line, Pro Poly HEXtreme provides great tension maintenance and supreme playability right off the stringing machine. When Pro Supex came onto the market a few years ago, their textured polyester offering created a ton of buzz in the tennis string market. 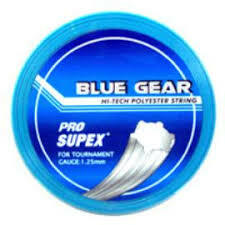 Pro Supex’s Blue Gear has a gear-shaped cross section as the name implies. This gear shape gives the user even greater access to spin than previous hex-shaped polyesters, even in thicker diameters. This string is also less susceptible to notching with its unique design. The only drawback I have encountered is that after some time the gear shape on the string can wear down with play, but this is only in extreme cases. The final and most recent method of manufacturing spin-producing textured polyesters involves coaxially twisting the string about itself creating a “twisted” cross section. Both Genesis’ Spin-X and Signum Pro’s Blackline Tornado are great examples of this new method of manufacturing. These two offerings provide the best ball bite and spin access of the bunch with little feeling in the arm. They provide the ultimate blend of control, spin and durability. All of these strings can benefit most tennis players, whether through a full string bed or a hybrid setup with a softer synthetic gut or multifiliment in the crosses. I recommend checking them out if you haven’t yet; they could easily help raise your game to the next level!